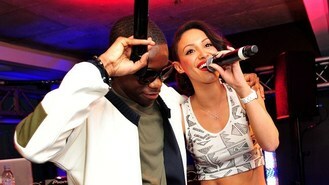 The Number 1 star and rapper friend Angel performed to a VIP crowd at the party at the top of London's Centre Point before the Sugababe joined Tinchy on stage to duet on the 2009 hit I'll Never Leave You. Amelle said earlier: "I'm so proud of him. We did a track together and we've been friends ever since and I just went to his dressing room to say hello and good luck for the show and how proud I am. I'm just so happy for him." The 25-year-old hip hop star from East London has designed his own collection of Goji headphones called On Cloud 9 available exclusively at Currys and PC World from mid-July. "Obviously music's my first love so headphones, the quality of the sound is really important to me. "I'm literally On Cloud 9 right now."